Is the Uber-Motherboard pitch an indictment of tech journalism? No. Motherboard is running a week of stories about Uber. We asked the company’s public relations department what stories it thought the media should be writing about, and this story was one of the things Uber pitched. This original text, recorded here and here, was subsequently replaced by a much longer explanation. The entire tempest in a teapot clarified a few things - most notably, that Uber did not pay for the article. However, a question still remains - possibly. ... it just feels like they [Motherboard] are trying not to rock the boat too much. Now that the tech media do not even bother concealing they are just a PR appendage to Silicon Valley, you have to worry how the accumulation of so much power and cash in one industry – combined with aggressive legal campaigns targeting the few who, for whatever reason, are still critical of it – is happening at a time when there is no one to keep our new elites on their toes. Morozov is arguing that the media in Silicon Valley is dramatically different than media in other places. He's made similar arguments before. But is coverage of non-tech stuff truly different than coverage of tech stuff? Journalists in ALL industry sectors "just recycle press releases" all the time. Frankly, that's one of the reasons why Narrative Science (despite Morozov's concerns about its ultimate state) is able to work successfully; if your typical business coverage merely consists of repeating little bits of information, well, a computer can write that. The article reported what a candidate said, and the writer felt it necessary to turn to a spokesperson for that candidate for clarification? But I thought you only buttered up to sources in the tech industry, not other industries. Then again, perhaps media coverage of the Trump campaign may not be the best example to use to talk about critical coverage. May 30 is a holiday in the United States (Memorial Day), so this is as good a day as any for me to attempt to snag 1 billion readers by writing something for the Indian market. I've done it before. May 30 turns out to be day that the Nextbit Robin will be introduced in India, and it's fascinating to observe how Nextbit has to adapt to the Indian market. One difference is the price. The Nextbit Robin is being offered in India at the equivalent of US$300, as opposed to the $400 that someone in the United States would spend. Since phones often have to be activated by local service providers, this price difference can probably be maintained without all of us in the United States rushing to Flipkart to buy Indian phones. Another difference is the lack of a microSD card. Not for price reasons, but because (according to Ryan Whitwam) microSD cards are "extremely uncommon in the Indian market." Instead, Nextbit offers cloud storage capability. By merging cloud and onboard storage, Robin seamlessly backs up your apps and photos, intelligently archives the stuff you’re not using, and easily restores items when you need them. Now the biggest problem with the cloud storage system is that in India, connectivity is a major problem. The cloud storage works seamlessly on a WiFi connection on the Robin, but struggles over 3G or a 4G connection. For instance, when I didn't play Real Racing 3 for a wee,k the phone backed up the app and its data to the cloud. And after a week when I felt like giving the game a try I had to wait for 15 minutes for it to download the app back to my phone, given that the app was over 1 GB. Connectivity is a real problem in India, and one realises it when phones like the Nextbit Robin, boasting of the cloud-first approach, comes to India. Frankly, even in the United States this may be problematic - if your service provider charges you for the data uploads and downloads. Back to India - the Nextbit is an Android phone, and Android does well in India. Samsung Electronics, Micromax Informatics and Intex led the Indian mobile phone market in the quarter ended March....It was a huge quarter for Indian brands - their share of the smartphone market was at an all-time high of 45%, while 67% of all phones shipped were made in India, according to CyberMedia Research's India mobile handset report on Tuesday. Apple in India? Less than one percent of the market. In the United States, the iPhone market share is over 40%. The Carolina Donut Festival was clearly not "marketing free"
Years ago, some tech conference promoted itself as being "marketing free." If any speaker started to do any marketing, the speaker would be immediately battered by signs. Expertly constructed sign...whoops! (Ducks) However, the company that promoted "marketing free" stuff ended up going bankrupt. I was recently reminded of the continued importance of marketing when I heard about a stellar event in Marion, North Carolina. The Carolina Donut Festival, which is taking place as I write this. As of Tuesday, the festival had 66 vendors lined up. These include vendors for arts and crafts, non-profit organizations and direct sales. These vendors will be lined up along Main Street in the block in front of Mr. Bob’s Do-Nuts. 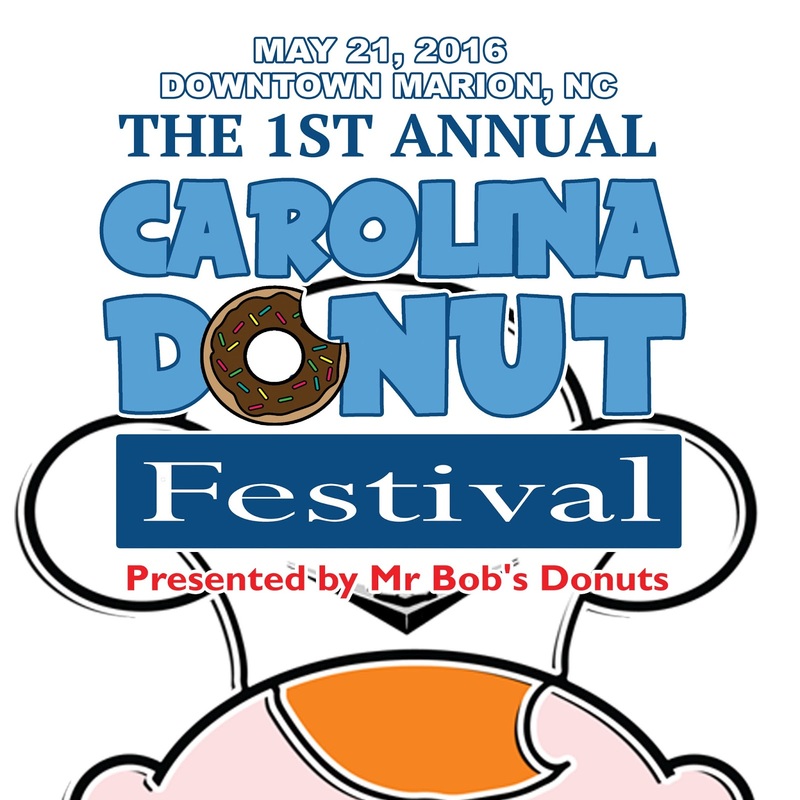 The Carolina Donut Festival Pageant will then take place after the opening ceremony. Masiello and Morgan said Tuesday the pageant so far had 38 contestants lined up, which includes male and female contestants. They will be in different age divisions: birth to 18 months, 19 to 35 months, 3 to 4 years, 5 to 6 years, 7 to 9 years, 10 to 12 years, 13 to 15 years, 16 to 19 years, birth to 6 years (male) and 7 to 19 years (male). The contestants will come from Spruce Pine, Troutman, Lenoir, Shelby, Morganton, Hickory, Newton and Dallas, N.C., in addition to those from Marion and McDowell County. Sounds like a lot of stuff, and I haven't even mentioned the donut part. This is, after all, a donut festival. For that part of the festivities, I will turn to a friend of a friend, who posted a review on a semi-private Facebook post. Left after getting funnel cake, not even a doughnut. Lol. Yup, that's right. 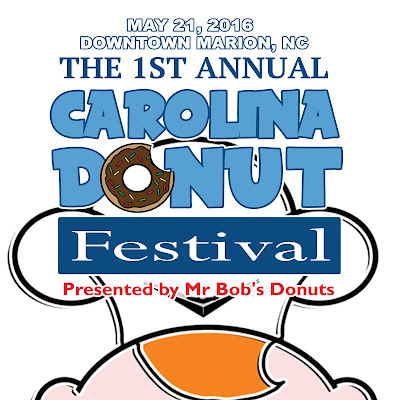 The entire Carolina Donut Festival is the brainchild of Mr. Bob himself, the donut (whoops, do-nut) guy, along with an events coordinator. If you want to try someone else's donuts, go to THEIR festival. Since this business opened in October 2014, Mr. Bob’s Do-Nuts has proved to be a big hit in the local community. Owner Bob Masiello serves up doughnuts, cinnamon buns, Danishes, cannoli, bagels and cream cheese. Customers can also enjoy a cup of hot coffee with their treats, all of which is made fresh every morning. As you can see, Marion has been blessed with an amazing vendor - one who has served the community for over EIGHTEEN MONTHS, and who serves donuts that are made FRESH. Not only that, but he also serves COFFEE. Where are you going to find an establishment that has done all of that, for so long? Yet, despite all of this, I am not criticizing Mr. Bob for coming up with this idea. I am criticizing myself for not thinking of it first. The Empoprises Festival Planning Committee is being set up as I speak. Brad took his usual exit off the Silicon Freeway. His morning commutes were sometimes filled with traffic, but today was rather pleasant. This would put Brad in a good mood as he drove to his company. Yes, his company - he founded it. A typical 21st century virtual company, Brad's firm provided an app that allowed its users to access specialized content. Typical of today's service offerings, the users didn't actually own the app, or any of the content that they accessed via the app. But the users found the service to be valuable, and kept on downloading the app. Brad still had to work out the whole revenue part of the equation, but his backers seemed to be happy. Brad turned down a side street to get to his office building - and was surprised to find a gaping hole where his office used to be. Within a minute, he was on the cell phone to his landlord. "Where's my office?" Brad shouted. "Sir," replied the landlord, "that was not YOUR office. That is OUR office, and it is no longer available." "But I have lease papers! That's my office, and you had better get it back!" "And where are those lease papers?" asked the landlord. There was a pause. "In my office." "And we have a duplicate copy here," replied the landlord, "and if you consult page 462 of the terms of service agreement, you have acknowledged that your company did not own the building in question, and that we had the right to revoke access to that building at any time." "But that's unfair! You can't just take something away from people with no notice!" The landlord calmly replied. 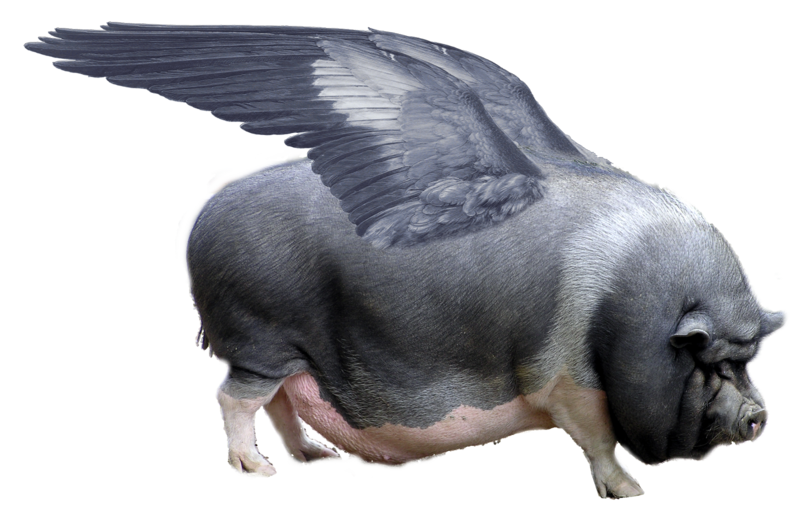 "Perhaps you should have thought of that BEFORE you removed the flying pigs movie from your app. I really liked that movie."